Monoclinic phase TaTe2 has a metallic, superconducting (at 0.1K or under applied hydrostatic pressure), and charge density waves behavior at around 160-180K. Environmentally stable monoclinic phase TaTe2 crystals have been synthesized at our facilities through flux zone method and chemical vapor transport (CVT) technique. Offered TaTe2 CDW crystals are perfectly layered, oriented in 0001 direction, and thus ready for exfoliation. Our crystals possess extremely low defect concentrations ranging from 1E10 to 1E11 cm-2. Flux zone grown TaTe2 crystals come with guaranteed CDW behavior. Each order contains highest quality scientific grade crystals and each and every crystal undergo four (4) different characterization technique to ensure crystalline quality. 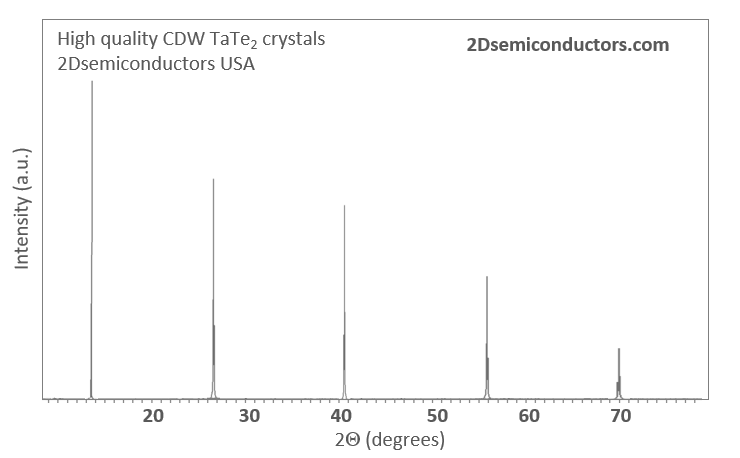 Flux zone vs. CVT growth method: Contamination and defects in TaTe2 crystals are well known to greatly influence CDW behavior such as CDW temperature, the presence of CDW behavior, electrical resistivity, etc.). Flux zone technique is a halide free and slow growth technique used for synthesizing truly electronic grade vdW crystals. This method distinguishes itself from chemical vapor transport (CVT) technique provides quick (~2 weeks) growth but poor crystalline quality while flux method takes ~3 months, ensures slow crystallization for perfect atomic structuring, and impurity free crystal growth. During check out just state which type of growth process is preferred. Unless otherwise stated, 2Dsemiconductors Inc. ships flux zone crystals as default choice.